Knights in armor fights, dancers, medieval recipes, history of Requesens family and juggling fire in the main courtyard of the palace. 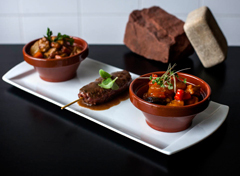 A dinner show that will not leave you indifferent! 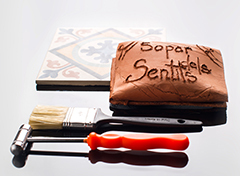 Dinner of Senses is a cultural experience at the Royal Academy of Medicine of Catalonia that wants to bring the history of medicine in Barcelona, as well as introduce participants to the basics of sensory neuroscience through a gastronomic game which they involve all the senses. 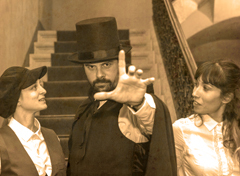 The Dinner of the Enigma will transport you to the 19th century, where, with the help of our personages, you will have to discover the mystery of the Faculty of Medicine. Listen, observe and join the pieces of the puzzle to find the solution. Live this theatrical experience, it will not leave you the same! Come and enjoy a magical night at the Requesens Palace, let yourself be hypnotized by the dancers and savor a menu of Persian inspiration. A unique experience in Barcelona! Walk along the streets where they lived and taste their best celebration recipes while listening to the soft music of that time. You will discover the Main Synagogue, the most ancient of Europe. With the explanations of the guides, will you have a glance at the history of this special site, and anecdotes of the symbols and architectural parts of the building. 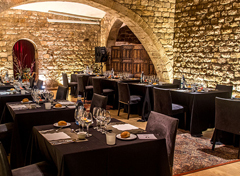 First a Medieval Dinner to discover the life and customs of the Requeses family in his palace. 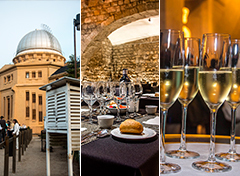 Second, a Dinner of the Senses where you can visit one of the most emblematic buildings of the XVIII century. 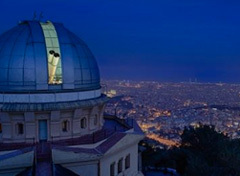 For dessert, a Dinner with Stars, where from the terrace of the Fabra Observatory you can enjoy the best views of Barcelona.